Text © Copyright April 2017, Bill Kasman; licensed for re-use under a Creative Commons Licence. The old and historic village of Falkland has always been one of my favourite places not least because I have family connections with the village. My grandmother was born in Falkland and her sister, as a young girl of just twelve years old, was taken into domestic service with one of the local gentry some time before the First World War. 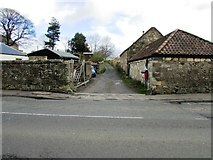 Cousins have also owned property in the village one of which is the subject of one of the photographs. Being less than a 20-minute drive from my home my wife and I have spent many a pleasant afternoon wandering its twisted streets and admiring its many wonderful buildings. We have spent time in its coffee shops (and its bars!) talking about the village with the local people. As a keen walker, I have explored the surrounding area extensively including the nearby Lomond Hills Regional Park one of whose hills, East Lomond (known locally as 'Falkland Hill'), overlooks the village (see Lomond Hills Regional Park collection Link ). Falkland has historic royal connections going back beyond the 12th century and saw most of the early Scottish rulers and the later Stuart monarchs. Mary, Queen of Scots spent some time there. This collection consists of nearly 300 photographs and in taking them I have erred on the side of caution in that any highway or byway which I could not identify as being freely accessible to the public 24 hours a day was one where I did not dare to tread! This did not happen often but it is the reason why there are no photographs inside the grounds of Falkland Palace or its gardens. Many images have additional historical or interesting comments attached and many are also linked to other relevant images. 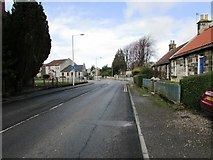 The village of Falkland is in the Fife Region of Scotland on the eastern side of the country Link . Fife is bounded to the south and east by the Firth of Forth and to the north by the Firth of Tay. Its western limits are defined by its boundaries with the neighbouring regions of Perth and Kinross, and Clackmannanshire. All of the images were taken in either March or April of 2017 and form a pictorial record of the highways and byways of Falkland in the spring of that year. Since this collection is a 'snapshot' of a short period of time in the life of the village I have decided not to allow any collaboration from members but if you should find any discrepancies or wrong information please don't hesitate to drop me a line and I will see what can be done. 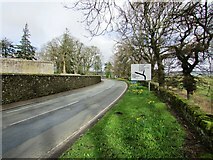 The approach to Falkland on the B936 road from Newton of Falkland. 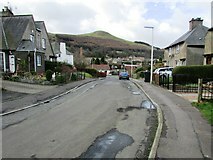 The hill on the left is East Lomond (locally called 'Falkland Hill'). It is part of the Lomond Hills Regional Park. Leaving Falkland the B936 road heads towards Newton of Falkland. 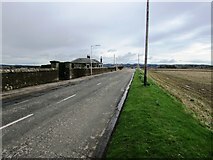 Falkland cemetery is on the left. 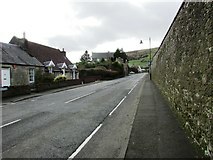 Entering Falkland on the B936 road from Newton of Falkland. 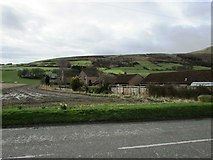 Falkland cemetery is on the right. 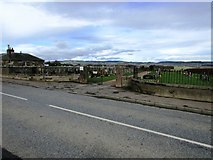 Falkland cemetery is on the outskirts of the village on the B936 road to Newton of Falkland. 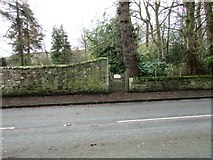 There is another entrance to the cemetery situated to the left of the house with a sign on the gate which indicates that Commonwealth war graves may be found therein. 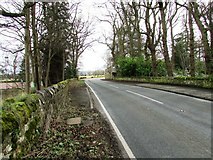 On the B936 road into Falkland from Newton of Falkland and just past the cemetery can be found the premises of Alan Bennie, motor engineer. 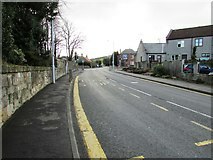 Looking down Newton Road (the B936 from Newton of Falkland) from just past the cemetery the road leads to the only roundabout road junction in the village where the B936, the A912, South Street and (the) Pleasance meet. 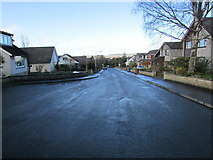 The turning into Lomond Crescent is visible on the right. From more or less the same position as this image NO2507 : Newton Road, Falkland the rear of some of the houses in The Riggs can be seen backing onto a ploughed field. 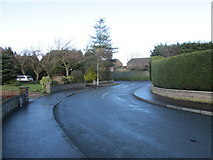 Lomond Crescent can be accessed from two directions. 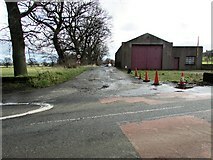 This is the access from Newton Road (B936). 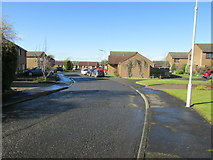 (See this image NO2507 : Lomond Crescent, Falkland for the other access). This was originally a development of local authority housing but many of the houses have been purchased over the years by their tenants under the government 'Right to Buy' scheme which came to an end on July 31st, 2016. 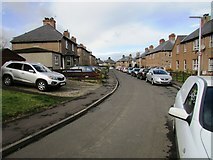 Lomond Crescent heading towards its junction with Pleasance. Falkland Hill (East Lomond) is prominent. 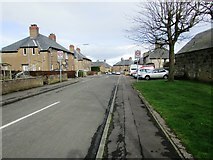 Lomond Crescent's junction with Pleasance. The white cottage straight ahead is 'Edgemont Cottage' which had a 'for sale' sign in place when this photograph was taken. 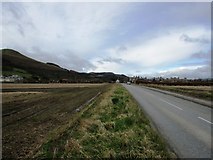 From Pleasance we look along New Road which leaves Falkland heading north. 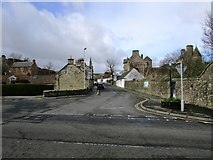 The turning to the left is East Port which leads past the palace and into the heart of the village. The wall bounds the palace gardens. 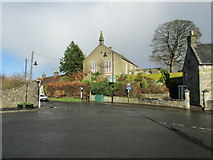 The building with the small spire is Falkland East Church which is now a private house. 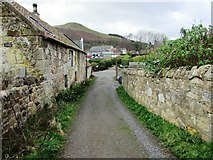 From where Pleasance becomes New Road the East Port leads into the heart of the village. The wall on the right bounds the palace gardens and the white building is the palace shop. The palace itself can also be seen on the right. From where East Port joins it New Road heads north out of Falkland. The wall on the left bounds the palace gardens. New Road heads north out of Falkland. Just round the bend the road becomes the A912 to Strathmiglo whilst a turning to the right (B936) leads to Dunshalt. The wall on the left bounds the palace gardens. The rear entrance to the palace gardens is just out of sight around the bend. From the A912 road to Strathmiglo just at the rear entrance to the palace gardens the B936 heads to Dunshalt. 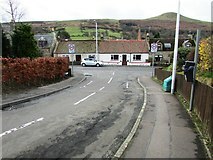 Falkland Tennis Club is on the left. After leaving Falkland and just past the junction with the B936 to Dunshalt the A912 heads for Strathmiglo. 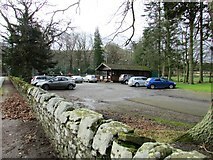 At the left of the image can be seen a wooden gate with a white sign which reads 'Falkland Bowling Club' but the path it leads to is overgrown and obviously not in regular use. 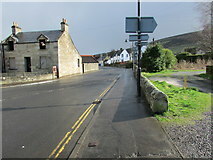 The approach to Falkland on the A912 from Strathmiglo has a sharp bend to the right just before the village. At the bend the B936 heads left to Dunshalt. The rear entrance to the palace gardens is just around the bend on the right-hand side. 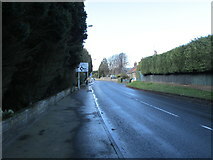 Falkland Tennis Club is on the left just before the B936 turning. 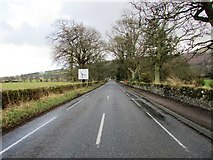 The B936 from Dunshalt approaches the junction with the A912 Strathmiglo to Falkland road. 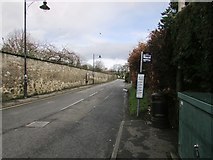 The entrance to Falkland Tennis Club is marked by the orange barriers on the right. 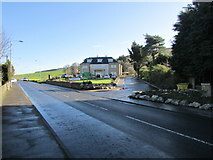 Founded in the late 1970s on a site leased from the estate at a nominal fee Falkland Tennis Club is seen here from the B936 road to Dunshalt from which road it is entered. 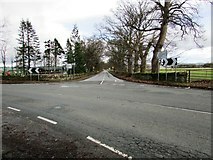 The B936 road from Dunshalt joins the A912 Falkland to Strathmiglo road (turn left for Falkland). The gates straight ahead are the rear entrance to Falkland Palace gardens although there is no public access here. 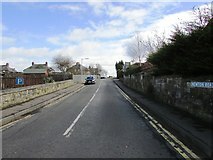 The A912 from Strathmiglo becomes New Road as it enters Falkland. 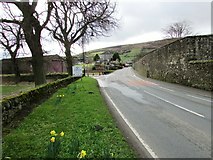 The turning to the left leads to Falkland Golf Club and the wall on the right bounds the palace gardens. 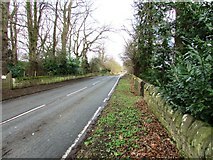 From almost the same position as this image NO2507 : Road to Falkland Golf Club New Road continues into Falkland. 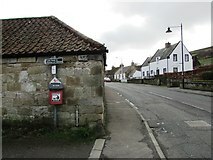 The sign on the post marks the beginning of the Laich Road where it leaves Pleasance. This is a green 'ScotWays' Link sign which indicates that this road is a Right of Way. 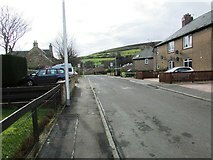 Looking down Laich Road towards its junction with Pleasance. 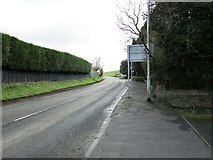 The road directly across the junction is signposted 'Oakbank'. Situated in Pleasance this is the vehicular entrance to the school. 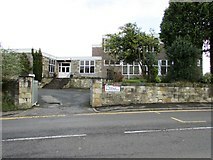 Built in 1967 it is the only primary school in Falkland and also serves the village of Newton of Falkland and the surrounding area. 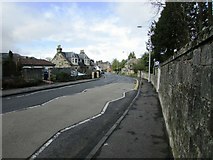 Pleasance approaches the only roundabout road junction in Falkland where it meets South Street, the A912 and the B936 Newton Road. From the only roundabout in the village Pleasance heads towards East Port. 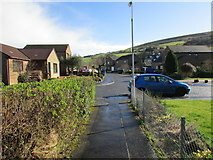 The vehicular entrance to Falkland primary school can be seen on the right between the first and second lamp posts. 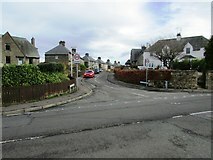 At this mini roundabout the B936 Newton Road (from where this photograph was taken) meets the A912 (left), South Street (ahead) and Pleasance (right). 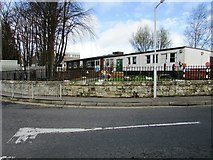 The white building on the left has no business name on it but a sign indicates that garden machinery and other small plant is repaired and serviced there. 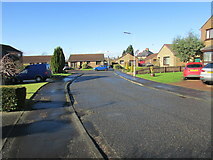 Falkland primary school NO2507 : Falkland primary school stands close to the only roundabout in the village NO2507 : The only roundabout in Falkland! The A912 from the New Inn roundabout approaches the only roundabout road junction in Falkland NO2507 : The only roundabout in Falkland! 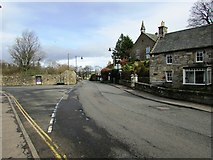 The A912 leaves Falkland heading towards the New Inn roundabout. 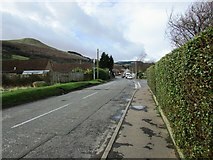 Newton Road from near the only roundabout road junction in Falkland NO2507 : The only roundabout in Falkland! 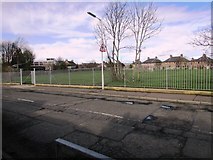 The black railings in the left foreground mark the playground of Falkland primary school and the white railings at the parked car mark public playing fields. 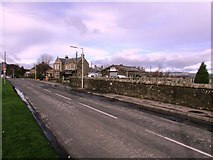 Pleasance from its junction with East Port. The Riggs seen from the pedestrian path from Newton Road. 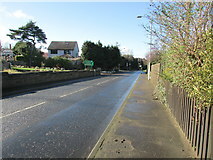 Looking towards the pedestrian path from The Riggs to Newton Road (immediately to the right of the blue car). 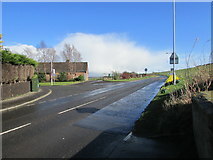 From near its junction with the A912. 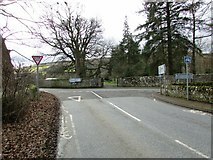 Entrance to The Riggs from the A912. Opened in 2013 this state-of-the-art care home has 50 bedrooms on three floors. 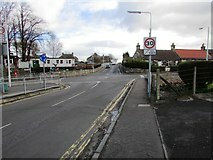 The A912 from New Inn roundabout approaches the only roundabout in Falkland NO2507 : The only roundabout in Falkland! From the turning area at the top of the cul-de-sac of Liquorstane looking towards the bend just before its junction with the A912. 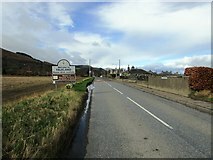 Liquorstane and its junction with the A912.